One hundred people stood on the front deck as Hurtigruten’s MS Finnmarken approached Kirkenes on the morning of 21st July. I was one of them scanning the horizon as the final islands passed by, but I supposed I’d be the only one leaving our new destination under my own steam. And, I was pretty confident, there definitely wouldn’t be anyone else leaving on a waterbike. For over a decade I’ve been led by a quest called Expedition1000, a project to undertake twenty-five different journeys over 1000 miles in distance, each using a different form of non-motorised transport. From skateboarding across Australia to paddle boarding the length of the Mississippi, my memories are now shaped around those moments spent mid adventure; the wild campsites, battling violent headwinds, chance meetings and serendipities with strangers that would become friends, and the milestone events on each journey - the beginning, the thousand-mile mark, and the end. 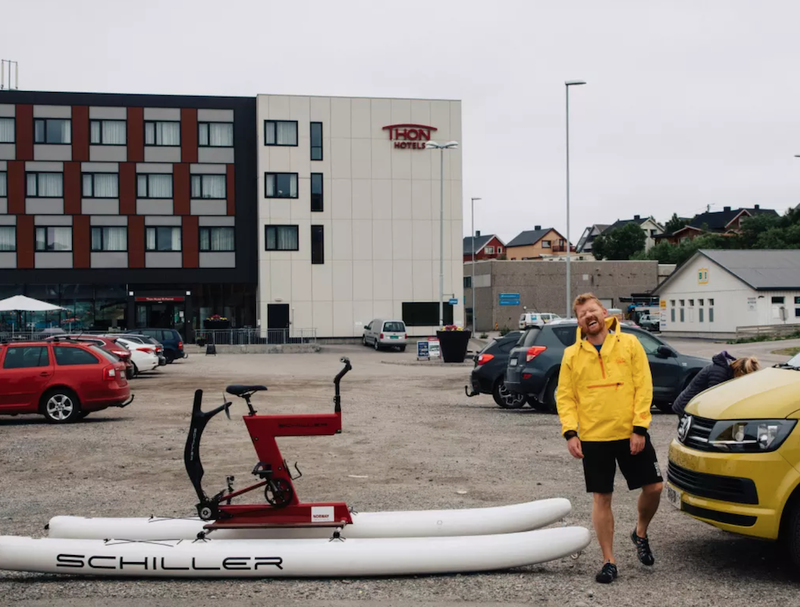 Kirkenes is where I begin my 14th journey over one thousand miles, and my transport this time is a Californian-built Schiller Bike, a bicycle set up on two inflatable pontoons, which moves along thanks to a pedal-powered propellor. Strange, you might think, and you’d be right. 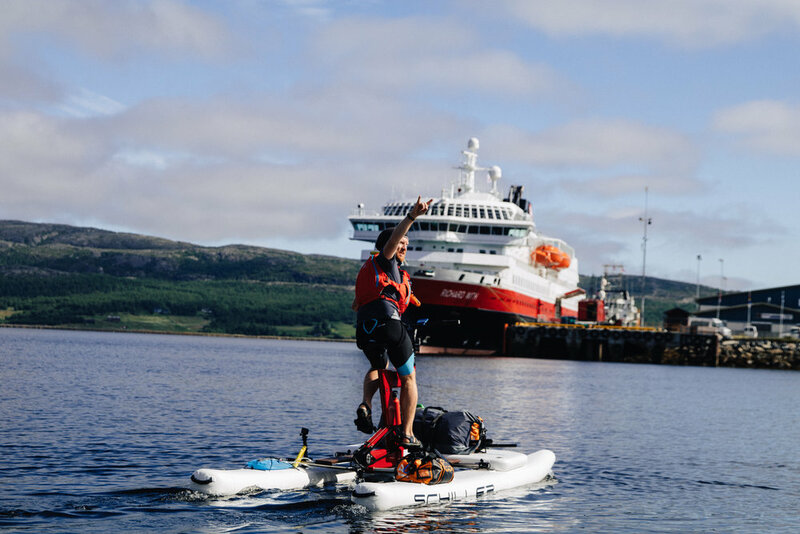 In fact, should I make it through the inevitable challenges Norway’s vast coastline has to offer, this will create a new world record for the longest distance travelled by a bicycle on water. After three days of prep, based out of the Thon Hotel in Kirkenes, I pedalled away from the beach just one hundred metres from the MS Richard With, named after Hurtigruten’s founder, who began his first journey from this very city in 1893. I was very aware, in those blissfully calm first miles, that I would be retracing a journey known as the world’s most beautiful voyage, but that my experience would be much slower than the thousands of lucky Hurtigruten passengers who experience this coast each year. My first week on the water has seen 135 miles pass under my bows. I’ve been joined by dolphins and seals, found hidden beaches and rocky bays, shipwrecks that could tell decade-long stories and abandoned cabins with views that most millionaires would dream of. Patches of snow still cling to the north-facing grooves of the cliffs that plummet straight into the ocean, a reminder that even though the days are 24 hours long at present, the Winter and its corresponding darkness will be back again soon. Compared to my surroundings, I am small and insignificant as I pedal slowly (at around 4mph) around headlands and across fjords, but the friendliness of everyone I have met these last few days makes me excited to visit each new town, village and shoreside hamlet. From fishermen to artists and owners of guesthouses and bistros, the Norwegians have an air of calm about them, a spirit riddled with the positivity one needs to get through the long cold of Winter but the grounding that only nature of this beauty can bestow upon a human. It’s hard to take for granted the scale of the mountains and the power of the waves, and the resulting respect for life and nature carries its way through everything the locals do. My only previous visit to Norway was a two day spell kayaking along the Oslo fjord, but the north, this place they call Finnmark, it is spectacular. If you need to climb high to get a good view, then this is almost the top of the ladder. I’ve felt like I’ve been travelling around the edge of the world some days, coastline to my left and endless hungry sea to my right. In one week I have pedalled through soaking rain, sunshine that had me down to my t-shirt and shorts, deep fog and the flattest of wide ocean. I can’t imagine what is too come in the next seven weeks, but I’m ready for this experience to become a part of me.